Be prepared, speak with authority and, above all else, deliver on the project. 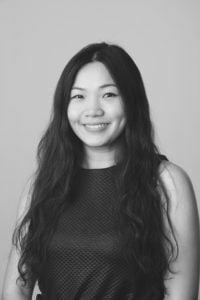 It’s the best way to stymie gender bias on site, says Daphne Cheong, project architect at GHD Woodhead and our latest profile in the Women in Architecture series. As an alumnus of the University of New South Wales, Daphne graduated with a Bachelor of Architecture degree and a Masters in Architectural Design. After graduation, Daphne spent four years with GHD’s architecture practice, followed by a two and a half year stint with Billard Leece Partnership as a Graduate Architect. In 2014, Daphne became a Registered Architect and later that year returned to GHD Woodhead, where she currently holds the role of Project Architect, responsible for managing multidisciplinary teams. Every new project brings with it a unique set of challenges, which require innovative solutions. The opportunity to demonstrate my resourcefulness, knowledge and creativity in overcoming such challenges is extremely rewarding. I have always enjoyed the hustle and bustle of the collaboration and teamwork involved in a big project—that feeling of being part of a group of passionate individuals working towards a shared goal. A successful piece of architecture does not begin and end with the architect, but rather the collaborative efforts of the architect, consultants, clients and stakeholders. 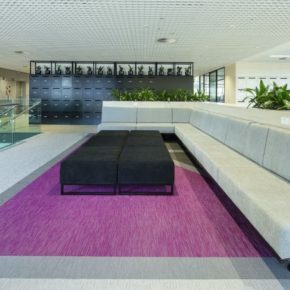 During my time at GHD Woodhead, I have worked on a number of major projects such as the Roads and Maritime Services (RMS) workplace in Parramatta and a number of Australian Nuclear Science and Technology Organisation (ANSTO) projects. 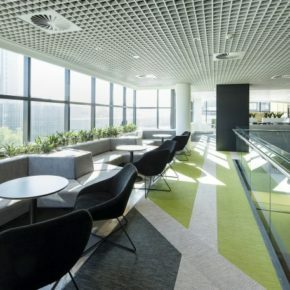 RMS is revitalising its office accommodation across the state in line with its vision to be the leader in the management and delivery of safe, efficient and high-quality services and infrastructure to NSW. RMS is seeking to attract and retain high-quality staff who are agile and collaborative. 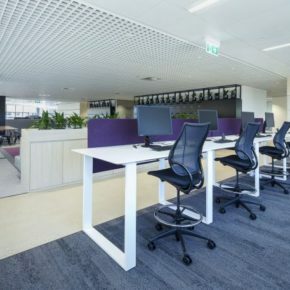 In line with this strategy, office accommodation is changing to support an Activity Based Workforce (ABW). 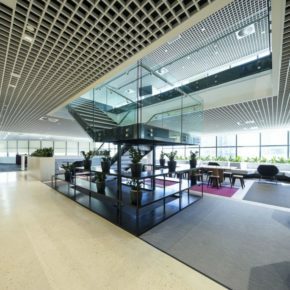 The floor planning comprises neighbourhoods of varied work settings, enclosed meeting rooms, semi-enclosed collaborative areas, quiet nooks and open plazas, with each of the nine floors having its own feeling with the use of colour and geometry. I am delighted to say that wherever I have worked there has always been a professional respect for women, and I have had the privilege of working with some highly accomplished women in senior positions. Where I have experienced challenges as a woman in architecture is when dealing with external consultants. It is not unusual to attend site meetings, only to find myself marginalised in favour of a male counterpart when discussing a project. My approach in dealing with such situations is to be thoroughly prepared, speak with the authority that comes from my knowledge and experience and, above all else, deliver on the project. Allan Miller is the principal architect at GHD Woodhead, with 35 years of industry experience under his belt. Whilst his architectural knowledge is profound, it is his willingness to share this knowledge that I find inspiring. Allan’s generosity and patience with all his colleagues are traits I hope to emulate as I progress in my career. Elena Bullo, GHD Woodhead’s architectural team leader, is another individual I look up to for her integrity and resilience. She seamlessly balances her professional responsibilities with her role as a devoted mother. Tara Veldman, director at Billard Leece Partnership, is an exemplary professional recognised as an industry leader in healthcare design. Working with Tara served as a constant motivation to push me professionally, a reminder that what you achieve in the industry is limited only by your ambition and dedication to the job. Having eight years of professional experience and having recently registered as an architect, I feel I am now finding my place in the industry. GHD Woodhead has supported my development through career resiliency training, which has helped me zone in on what motivates me professionally. Acting as a technical sounding board for the junior members in the practice is a role I have found extremely rewarding. I see myself thriving in a managerial role within the team and aspire to be an inspirational leader. A lofty aspiration but one I believe can be achieved through a combination of self-initiative and continual learning on the job. Daphne Cheong was interviewed by Michael Smith from Atelier Red+Black. This profile is part of the Women in Architecture series co-published with the Australian Institute of Architects.